I've been wanting to see this movie since before I knew what it would be about. I loved the first one - I even watched it again recently. I've seen other Sherlock Holmes movies, and the wonderful Sherlock - Season 1 since I first saw Sherlock Holmes in 2009, so I've seen more versions of the character - and Watson now. I still love this version of the characters. I've only read one of the Sherlock stories...I have a book with most of them, but I can't remember where I put it. I need to find it and read more of the stories. I don't know for sure, but I think at least some of the story elements were pulled from one of the Sherlock stories. This plot for this movie isn't directly tied to the first movie, but it definitely builds on what was established in it. Irene Adler returns, though only briefly. I'm not that .....pleased with how her part of the story is handled, though it does make sense for the movie. Professor Moriarty is front and center as the villain. It is set up like Sherlock has been tracking him for a while, tying different crimes to him. The two do meet face to face only a few times, but those meetings are very well done. Yes it is known from very early that Moriarty is the main villain - the trailers make that very clear - but I don't think that hurts the movie. The audience even knows something before Sherlock this time. I like the plot and think it is very entertaining. I also loved how Watson's wedding is added into the mix, along with how Sherlock is trying to deal with the changes to his friendship with Watson. It is clear that he is sad about the thought of him and Watson not working together anymore. Some people may be disappointed that the mystery isn't stronger, but I think it is still very entertaining. Even while knowing that Moriarty is pulling all sorts of strings and manipulating various things, it takes a little while for the big picture to become clear. I really like that Moriarty is just as smart as Sherlock and I think that gives Sherlock more of a challenge and ultimately makes the story stronger. There is suspense in a few scenes, as well as some action scenes. The action scenes are done well. Sherlock fights again at different times, while still using his intelligence to deal with most situations. The movie has the same amazing look as the first movie, with new locations used. One late in the movie really looks amazing. I know special effects are used again, but I don't feel like they dominate what is going on. The humor is back as well, again mostly from the way that Watson and Sherlock interact. I love their friendship and how they bicker over little things at times. Sherlock shows off a few more disguises, including as a woman at one point. Watson and Mary's reactions to that disguise is very amusing. We get to see that Sherlock has another issue when he won't ride a horse, another humorous scene. The characters are wonderful and I love how Sherlock and Watson act with each other. Robert Downey Jr. and Jude Law are great in the parts. They have a good chemistry together that makes the relationship between Sherlock and Watson that much stronger. Mycroft turns up in a few scenes and I really liked Stephen Fry in the part. It would have been nice if he had a little more to do. Mary is limited to a few scenes again, so she isn't as developed, but she seems nice. She still has some issues with Sherlock. Simza is a new character tied to what is going on. She is a gypsy fortune teller. She is interesting, though she could have been a little more developed. Moriarty is a good addition to the movie and he makes a good foil to Sherlock. This movie is a lot of fun, like the first one. In some ways, I think this movie is a bit better. It is definitely worth seeing. I did get a review posted on Epinions if anyone wants to check it out. Yes it is known from very early that Moriarty is the main villain - the trailers make that very clear - but I don't think that hurts the movie. Didn't the end of the first film actially reveal him, so that it could be expected that he will be the main villain even since then...? 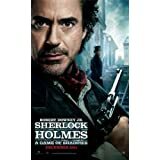 Mark Kermode gave quite a favorable review last week as well, particularly pointing out that the relationship between Holmes and Watson is the center piece of the film. Yes the end of the first one does sort of reveal him. He's only seen in shadow when meeting with Irene..that happened earlier in the movie..and he's seen from the back running away near the end I believe. Irene told Sherlock his name. I thought I had mentioned here that Moriarty was sort of introduced in the first movie..I know I did in the review I did at Epinions. I'm sure many people expected him to be in this movie. I even remember hearing speculation on who would play Moriarty right after the first movie opened. I'd agree with that...the relationship between Holmes and Watson is great and one of the best things about the movie. I just love how they interact with each other, especially when Watson is aggravated. It's just so entertaining to see him get annoyed by Sherlock. Watched it today in my local cinema. Have to agree that it's better than the first part. Still I would have expected much more from the cooperation of Downey, Jr., Law and Ritchie. But at least Downey, Jr can show us of what he is capable. In fact he does this so good that for very big parts this movie looks like a One-Man-Show. That's probably closer to how I felt. I also thought some of the story telling devices, while quite neat, weren't always effective. I don't mind a movie that makes me think. But I prefer to contemplate the story they're telling, not the telling of the story. Still, it was a blast and will be fun to watch them both when it's released. I pretty much love all Sherlock. Especially the BBC series Sherlock! I pretty much love all Sherlock. Especially the BBC series Sherlock! Yes! UK DVD is released at end of Januray. I am very much looking forward to that. Is that a second season? I loved the first one. I have no idea when more episodes will be out though. Yes, second season! DVD release date is January 23, 2012 and Amazon sells it for £12.99. Series 1 was region locked though. Ok..just checked Amazon here....nothing yet. I signed up to be notified when it is available. Blu-ray is region free and £12.99 from ChoicesUK but they charge shipping for outside UK (and they don't want your business... £30 Europe, £50 rest of world). Saying that, e-mail Amazon and ask them to price match. They will say they do not 'price match' but will still match it. It's not been screened yet. BBC DVDs normally appear about halfway to a third way through the run on TV. You mean the announcement or the release? Well, it's maybe only three episodes again, so they might air throughout the first three weeks of January followed directly by the DVD release...? First episode airs January 1st 2020hours - 2150hours here. Never seen it but members of my family raved about the first series also. I'm always so far behind with tv shows (as in years ). Release date is the 2nd January.